Looking forward to Lightfair next month where one of the keynote speakers is Dr. Shuji Nakamura the developer of the white LED. 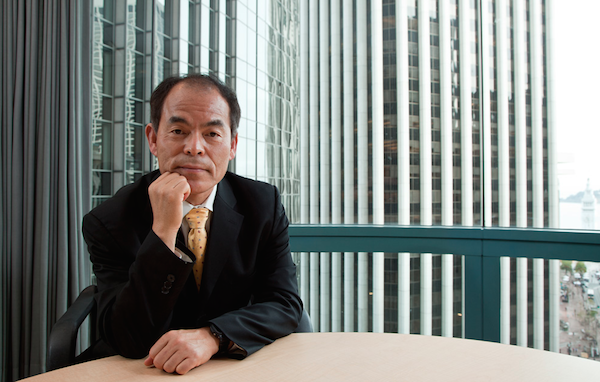 In 1994 Dr. Shuji Nakamura, founder of Soraa was awarded the 2014 Nobel Prize in Physics. His research leading up to the invention of the blue light emitting diode (LED) was a critical advancement in the development of the white energy-saving LED light we now see in use in households all over the world. "2014 Nobel Prize winner Shuji Nakamura may have single-handedly changed the technological face of the world. His discovery of p-type doping in Gallium Nitride (GaN) and development of blue, green and white light emitting diodes (LEDs) and blue laser diodes (LDs) has enabled energy-efficient, solid-state lighting used in displays, medicine and the next generation of Blu-Ray optical storage. Now, Dr. Nakamura’s inventions are poised to replace Thomas Edison’s light bulb and save the world billions of dollars in energy costs." "In 2007, Dr. Shuji Nakamura, along with pioneering professors Dr. Steven DenBaars and Dr. James Speck, came together and made a bet on an LED technology platform completely different than current industry practice, a technology most industry experts at the time considered to be impossible to execute. “We knew that our GaN on GaN™ LED technology would be the future of lighting and Soraa has made this a reality,” added Nakamura. Soraa bet that GaN on GaN™ LEDs would produce more light per area of LED and be more cost-effective than technology based on other foreign substrates like sapphire or silicon carbide. This strategy ran against every trend in the LED industry. That bet paid off: today, Soraa’s LEDs emit more light per LED material than any other LED; handle more electric current per area than any other LED; and its GaN on GaN™ crystals are up to a thousand times purer than any other LED crystal. The colorful LED mini-pendants from Troy RLM are pure fun and function.